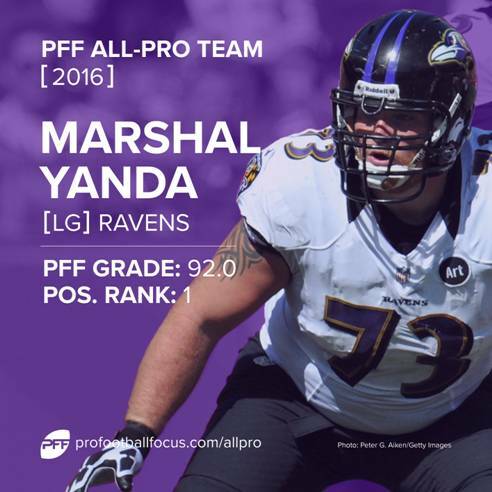 Baltimore Ravens G Marshal Yanda was recently named the winner of Pro Football Focus’ Best Offensive Lineman award for the 2016 NFL season. To see the winner of every PFF award, visit our NFL awards page. For the past two seasons, Ravens’ guard Marshal Yanda has been the best guard in football. This year was no different. The Ravens offense as a whole didn’t have nearly the success running the ball this season as they have in the past, but it had little to do with Yanda and more due to trying to replace Kelechi Osemele and dealing with injuries across the offensive line. Yanda continues to be one of the best run blockers in the league, regardless of position. He has proven to excel in both zone and man blocking schemes, though his niche is reaching defenders on zone runs. Through his combination of athleticism and technique, he can quickly overtake leverage on defenders, and he possesses the size and strength to finish blocks by overpowering defensive lineman to seal and widen the point of attack. While Yanda shines in both facets of blocking, he has always been a marginally better run blocker compared to pass protection — at least until the last season or two. In 2016, he allowed just six hurries on 612 snaps this season for a 99.2 pass-blocking efficiency, the highest rate by a guard in the PFF era (since 2006). To put that in another perspective, there were 28 occurrences this year where a guard gave up as many or more total pressures in a single game than Yanda allowed over 13 games. Dating back to the 2015 season, Yanda has not allowed a sack or hit in 1,014 consecutive pass-blocking snaps, a streak that will continue heading into next year. While a couple other players may be close to Yanda’s level, the thing that has set him apart from everyone else is his consistency week-in and week-out. Out of his 13 games this season, Yanda did not have one in which he earned an overall grade that was below-average, and just two that were in the average range. In fact, he has gone a staggering 52 regular and postseason games without having a poor overall performance (Week 10 of the 2013 season versus the Bengals being the last) and 41 of those outings he graded above-average or better. If that weren’t impressive enough, he has done so while playing three different positions along the offensive line. 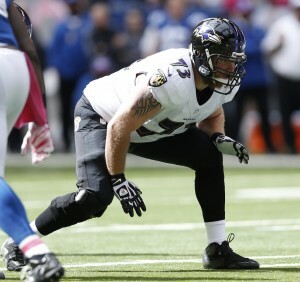 Yanda missed three games this season due to a torn labrum in his shoulder. When he returned midway through the season, the Ravens moved him to left guard to help lessen the effects of the lingering injury. Impressively, he graded slightly better at left guard than he did at right guard despite have never playing a snap at left guard in his pro career prior to the 2016 season. There are a few offensive linemen at the peak of their game right now, but no one has been better than Yanda of late and overcoming the injury and position change makes this season just that much more special.